You are close to everything. The airport, shopping, restaurants, and a bakery that will make you feel right at home. Order takeout and go back to the deck to look out over Gustavia Harbor and enjoy the sunset. The next morning, pay for your cinnamon buns and homemade bread with a trip to the fitness room. Relieve your muscles with a dip in the pool, and then reward yourself with a nap in the hammock, while you think about extending your stay for a day or two. If you get too much sun at the beach, the white, contemporary decor of the villa will cool you off and still let you look out at the views. Infuse your vacation with le grain de folie! View over Gustavia with gorgeous sunsets! 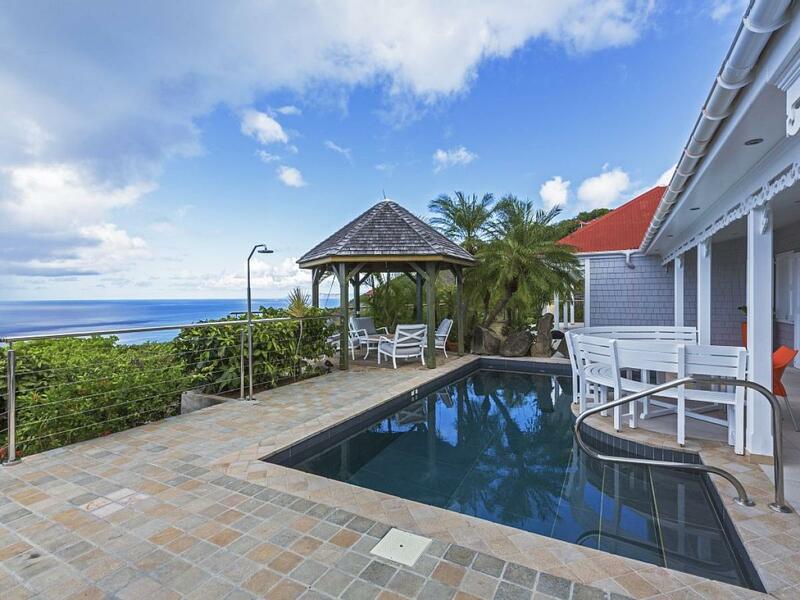 The two-bedroom, two-bathroom Villa Grain de Folie is situated on Colombier hillside and offers views of Gustavia, neighboring islands Saba and St. Eustatius, and sunsets. The villa is conveniently located. In the vicinity, there is a beach, bakery, and restaurants with delivery service. Grain de Folie is five minutes driving from the airport and from shopping areas. The villa features a contemporary decor. The living room and kitchen offer ocean and sunset views. The two bedrooms are equipped with air-conditioning and en-suite bathrooms and offer privacy. There is a fitness room with an ocean view and air-conditioning. A wireless internet connection is available throughout the property. From the dining deck, you can see the ocean from Gustavia Harbor to the east side of St. Barth. This is our 9th trip to St. Barth’s so we definitely have our favorite locations. Colombier is one of them. Grain de Folie villa is located in a very quiet area with our favorite bakery only 5 mins away. The birds sing all day and the frogs sing at night! The villa was remodeled several years ago and it is absolutely beautiful. Marble tile runs throughout the villa. There are two very large, equal bedrooms with ensuite bathrooms, as well as a hallway bath. The villa is furnished with a mix of old plantation style as well as modern furniture and it all works well together. The kitchen is very updated and modern. The only reason I gave 4 stars, and not 5, is that the internet connection is slow and only works in the living room. Also, to our disappointment, all of the foliage around the patio/pool area was hiding a fantastic view. You had to walk to certain areas on the patio to see the view. If the shrubs were cut down, the view would be outstanding. All in all, the villa is gorgeous and extremely well-cared for - a great place to stay. I must commend Shawna for working with us a few days before we were to arrive to relocate us to Grain de Folie. The villa we had rented, and stayed at last year, had major construction occurring all around it, so it was recommended that we not stay there due to the noise. Kudos to Shawna for securing an even better villa for us, and at the same price. Where to Stay was under no obligation to move us, but I truly appreciate the effort by Shawna to do so. Our vacation turned out to be very peaceful and quite relaxing. Where to Stay is fantastic - thanks Shawna!